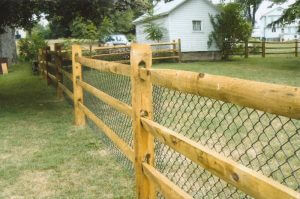 Fence Maintenance Service is your premier Fence Company for residential and commercial fencing in Venetia, PA. Whether you want to accent your home or add security to your office building, the professional fence builders at Fence Maintenance Services in Venetia have the skills and the tools to get the job done. When you consult with our team of experts, you can rest assured that you will get the right fence for your property and that is it installed by professional Fence Builders, so it will last for years to come. We take pride in offering a wide range of quality fence options to our customers. With a variety of colors and styles, wood fences are a popular option for residential properties to help complement the home and surrounding landscape. Fence Maintenance Services has a wide variety of style to choose including everything from picket fences to privacy fences. By choosing Fence Maintenance Service as your wood Fence Company in Venetia, you get the benefit of receiving a quality product combined with installation completed by an experienced Fence Builder. Ornamental fences are a beautiful way to add style to your Venetia home or business. Fence Maintenance Service has a variety of ornamental fences that come in different heights, styles, and grades: residential, commercial and industrial grades. Our ornamental fences are available from 36” to 96” high, with a wide range of different post size and thickness options. Vinyl fences offer an attractive appearance and are low maintenance, making them a popular option in Venetia. Although they are a popular option, keep in mind that not all vinyl materials are created equal. When you choose Fence Maintenance Service for your vinyl fence needs, you get an experience Fence Contractor who will provide you with a high-quality vinyl fence guaranteed to last a lifetime. Fence Maintenance Service offers chain link fences in a variety of styles, heights, and colors to meet your particular needs. As an expert Fence Contractor, we provide chain link fence installation in Venetia. Whether you want to establish property boundaries, add security, or keep pets in, our Fence Builders will help you select the right material to suit your application and will ensure that your fence is installed correctly and professionally. If you want to work with the top Fence Company in Venetia, PA, then choose Fence Maintenance Service for all your fencing needs. Our professional Fence Builders will complete your project with a high level of care and attention to provide you with an attractive, sturdy, high-quality fence you can rely on for years to come. Simply fill out our contact form with your specific fencing needs and our staff will be sure to respond promptly to help you get started on your project.